Understanding how organisms are related to each other in the grand scheme of things has been a main goal of taxonomists, ecologists, and evolutionary biologists for centuries. While traditionally, what things look like (morphological characters) and what they eat or produce (phenotypic characters) have been used for classification. However molecular tools have been a game changer in terms of figuring out who is related to who and where they fit on the tree of life. 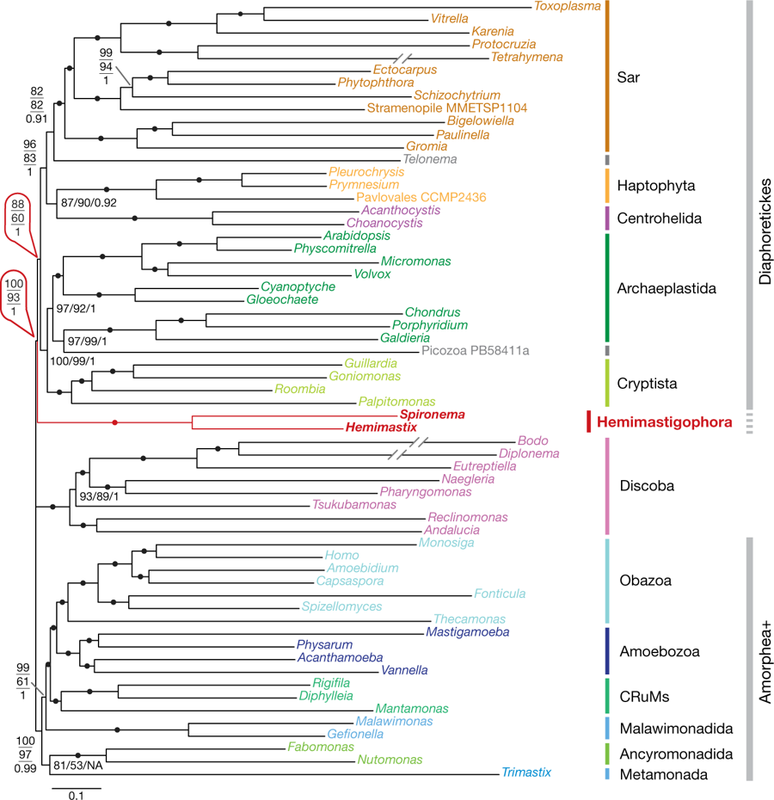 Last Thursday, a new letter out in Nature led by Alastair G. B. Simpson’s group in collaboration with other labs at Dalhousie University presented evidence that a group of eukaryotic protists (the Hemimastigophora) is MUCH more distinct than anyone thought. Although protists are tiny, they are still eukaryotes, so they have relatively complicated cell organization and are actually more closely related to us than bacteria (prokaryotes). The word “protozoan” means “early animals” and was first used in 1820 (Scamardella 1999). According to Simpson (in this informative article), protists most simply are “…all the eukaryotic organisms that are not animals, plants or fungi”. So…a whole bunch of stuff. The cute little protists of the Hemimastigophora were first observed in the 1800s, and were originally classified based on distinct morphologies. 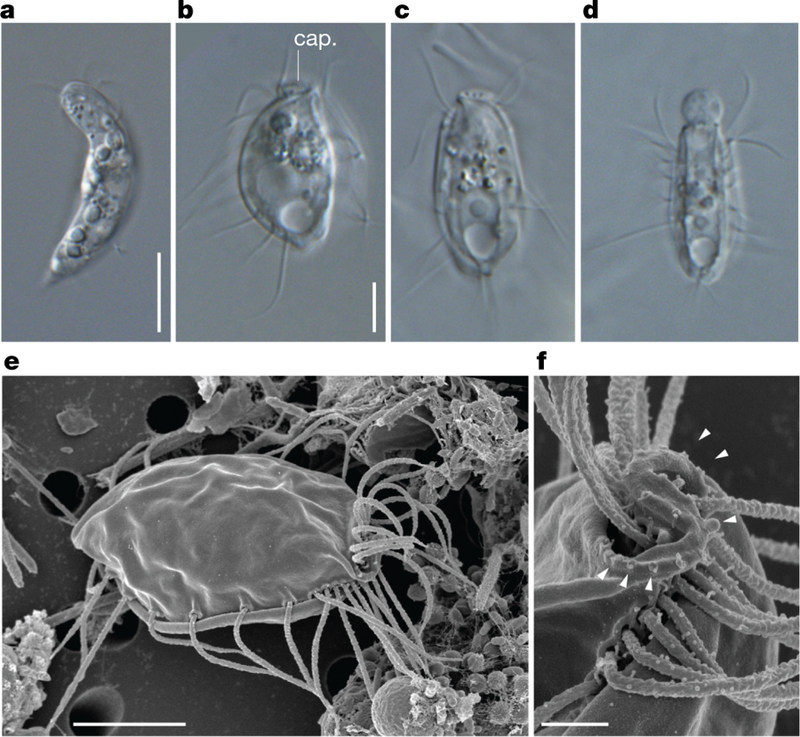 the authors describe them as, “free-living predatory protists with two rows of flagella and a unique cell architecture”. First, the Lax et al. used a cultivation independent approach (based on single cell transcriptomics) from two environmentally isolated cells from two different hemimastigoes. Second, they managed to isolate, describe and maintain in the lab the first ever culture of a hemimastigote: Hemimastix kukwesjijk. Where did these cells originate? Well it turns out that a very lucky graduate student just happened to pick the right dirt at the right time, from along the Bluff Wilderness Hiking Trail. Figure 1 (Lax et al., 2018). Micrographs of the newly identified species, note the ogre-like appearance and many scary hairs. The name of the new species (Hemimastix kukwesjijk) is an ode to the traditional lore of the Mi’kmaq people of Nova Scotia, referring to hairy scary ogres. If you’re interested in hearing about H. kukwesjijk and this phylogenetically distinct group from Simpson’s himself, take a listen to this brief interview with his own description of their “pistachio” shaped cells. As Simpson states, H. kukwesjijk is vicious, and can use a harpoon system embedded in one end of the cell to immobilize prey. Its many “hairs” can then help capture the prey, after which it engulfs cells sort of like an amoeba. The information we got from our microbes will be important for understanding the ecology of the planet. All previous attempts at classifying these little hairy looking cells were based on morphological characteristics, but Lax and colleagues were able to get sequence data. Specifically, they generated transcriptomes that they obtained from cells from two different Hemimastigophora (Spironema and Hemimastix) in their dirt sample. They then made a data set based on 351 genes from 61 previously reported taxa. Although neither of the transcriptomes from the cells the authors isolated were complete enough to have all 351 genes, they weren’t too shabby. From the Spironema cells they could include 290 and from Hemimastix, 280. After this solid phylogenetic analysis, Lax et al. constructed a highly supported tree that revealed the Hemimastigophora clade is clearly distinct. Figure 3 from Lax et al., (2018). Also known as, one of these things is not like the other, the Hemimastigophora clade forms the deepest branch within the Diaphoretickes. This branch is highly supported and remarkably distinct. acknowledges the region in which the species was isolated. So why does all of this matter and what does it mean? Well, there is a WHOLE NEW deep branching lineage in the eukaryotes that we hadn’t realized existed before. The authors refer to this as a “supra-kingdom-level” of diversity that has possibly been around for a billion years. This level of diversity is immense, to give you an idea of what it implies, Simpson states (Mainstreet NS interview), that another group at this level includes animals…..and fungi! This article a big deal because in order to understand the evolution (and origin) of eukaryotic cells, we need a good picture of that tree. Until this publication, researchers were missing out on an entire branch. …to understand the evolutionary history, you have to compare the genetic information of living groups.. This study was also interesting because the authors managed to cultivate the first ever Hemimastigophora representative. This research might be bringing us closer to identifying the last common ancestor of all eukaryotes and is an important step in understanding the diversity of life on the planet. Lax, G., Eglit, Y., Eme, L., Bertrand, E. M., Roger, A. J., & Simpson, A. G. B. (2018). Hemimastigophora is a novel supra-kingdom-level lineage of eukaryotes. Nature. Scamardella, J.M., 1999. Not plants or animals: a brief history of the origin of Kingdoms Protozoa, Protista and Protoctista. International Microbiology, 2(4), pp.207-216.